An observer who is capable of seeing the target and requesting a fire mission. The observer must be able to contact the firing unit or battery. This can be done by telephone, radio, or even flags and hand-signals. The observer must also be skilled enough to adjust fire onto the target. A firing element (gun, battery, or battalion) who is able and authorized to respond to a request for fire. The firing element must be allowed to respond to the request for fire. If they are not assigned to help you, or are busy elsewhere, you won't get your fire mission. Different nations had different doctrine for calling for artillery fire. We are going to examine some of these in excruciating detail later in the tutorial. Forward observers are trained call for fire missions. They have special radio equipment and are authorized to contact off-board artillery. Often they are the actual commander of an off-board battery. They will almost always have a better chance of calling in fire missions. Also, with the exception of the Americans, FOs are the only ones who can call for artillery in General Support. Commanders were often trained to act as observers, but did not usually have the skill of forward observers. Troops were sometimes able to act as observers for artillery directly attached to their unit. Because of a lack of education and training, most Russian troops were not able call for fire missions. However, Russian scouts were trained to act as observers. Level of Support specifies how unit or battery is supposed to cooperate with your forces. The level of support must be specified for every fire support element and unit capable of indirect fire. The support level will determine which units can act as observers and also how easy the missions are to call. Organic fire support is attached to a specific organization. Individual on-board units (guns and mortars) are attached directly to a maneuver or headquarters element. Organic fire support elements are usually attached to a specific battle-group. While organic support is the easiest to call, only units in its organization are allowed to act as observers. For a good example, look at the German Infantry Battalion BG-10 (p.72) that has 3 80mm mortars as Organic Support attachments and a German Heavy Mortar Platoon (FS-01) as an Organic Fire Support Element. Any unit in the entire Battalion can act as an observer for the FS-01. However, as per p.58, the 3 80mm mortars MUST be attached to either a maneuver element or the Headquarters element. Once a mortar has been attached, only units of that element may call for fire from that mortar. This is why they usually are split out among the companies to give each company its own organic support. Direct support fire support elements are dedicated to the battle as opposed to a specific organization. They almost always have their own forward observer, who can more effectively control them. Unlike Organic fire support elements, DS elements can be called by any eligible observer. However, the chances of successfully calling them is less, and national differences in the Call-for-Fire chart will sometimes restrict the types of units that can be used as observers. For all nationalities except for the U.S. only Forward Observers and Officers were trained to call fire. Usually DS elements are off-board batteries or Battalions. 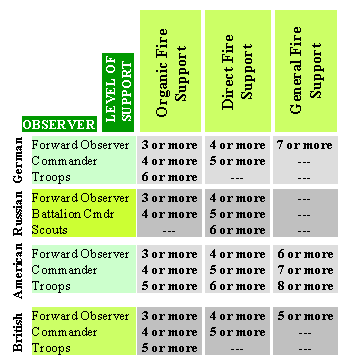 General support elements represent artillery that may be in use elsewhere and therefore is not available for your fire mission. Often, they are "slices" of fire support that are controlled by higher level organizations (division, corps, and army) that usually do not take part in a Battlefront WWII battle. Therefore a roll for GS is less likely to succeed. Also, with the noticeable exception of the Americans, the equipment and authorization to call for General Support Artillery was available only to designated forward observers. All text and images are © 2000-2017 Fire and Fury Games, all rights reserved. Web page design and maintenance by Webmaster@FireAndFury.com.